Her name means “beautiful blessing” in Hawaiian: Mahniya, pronounced mah-NEEyah, so lovely and special and meaningful. So fitting, her mother says, because Mahniya Humphrey came into this world seven months ago with extraordinary challenges. 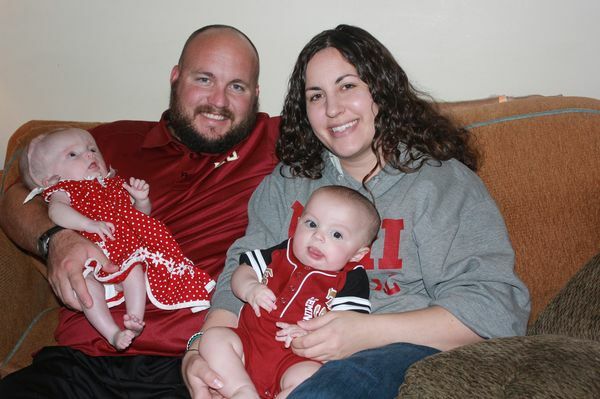 Nicole and her husband Steve, the former football coach at Seminole Ridge High School in Loxahatchee and a member of a well-known local coaching family, knew their daughter would be born with health problems. When Nicole was five months pregnant, doctors noticed fluid in their daughter’s brain, as well as something wrong with her spine, heart and kidneys. They diagnosed the baby with spina bifida — but later concluded that Mahniya had “aqueductal stenosis,” a blockage in her brain between two ventricles. Fluid compressed her brain, taking up most of her skull and pressing her brain into a small sliver of space against the bone. The swelling in Mahniya’s head was so great that when she and E.J. were born, on July 30, 2013, her head was the size of an average 14-month-old. Since then, tiny Mahniya has had four operations, the first when she was two days old, to place a shunt in her brain to drain the fluid. She faces two more major surgeries to reshape her skull. Her parents don’t know how well she will grow, or how much her brain will recover, or how well she will see. Her eyes roll inward and flutter. Her ears slope down — but they know Mahniya can hear. Although she failed a hearing test when she was in the neonatal unit, she recently passed one. So, who knows what blessings time will deliver? The Humphreys do know Mahniya’s family of supporters is vast. They know the power of a tight community. Steve Humphrey’s grandfather was Bill Humphrey, a hall-of-fame high-school football coach who coached at Lake Worth High School from 1964 to 1975. Steve’s father, Terry, and his three uncles, grew up across the street from Lantana Middle School, and still count their childhood friends as their best friends. Now, that community is coming together to help Mahniya. Craig Lamb, a childhood friend of the Humphreys, is organizing the third annual “Lantana Reunited Reunion-Benefit-BBQ Bash” — and all proceeds from the Saturday event will go to Mahniya’s medical needs. Lamb found out about Mahniya through her Facebook page. In more than 24 hours, that page raised $25,000 for her care — much of it from the Humphreys’ childhood friends. She was forced to leave her job as a high-school teacher to care for her twins. E.J. is a normal active baby, and he has just begun to reach out to interact with his sister. Steve had to leave his dream job as coach of Seminole Ridge to get a teaching job in Jacksonville, to be closer to the hospital where Mahniya can get specialized care. The pressure on Mahniya’s head can make her restless and irritable, but each day she sleeps better, her mother says. Sometimes Nicole can’t distinguish her baby’s headache pain from normal teething pain or soothe Mahniya’s cries, but each day she seems more relaxed, more pleasant, more aware. They believe in miracles, Nicole says. And her faith in beautiful blessings. For more information, see “I’m a Fan of Lantana” Facebook page or call Craig Lamb at 561-932-4922.